It is strange how legends are connected with the building of temples; whether these stories are true or not, they add to the popularity of the place. Here is one such temple which has an interesting legend and a long history behind its construction. It is the Babulnath Shiva Temple in Mumbai that takes us back in time to the 12th century. Today, it is one of the oldest temples in Mumbai and also a historical site. The enchanting architecture of this temple also makes it worthy to explore. The Babulnath Temple is situated in a suburb called Girgaum Chowpatty in Mumbai. It is a hillock temple which has become well-known over the years. Come, let us go on a virtual tour reminiscing the tales of this beautiful shrine. Once upon a time, there was a cowherd named Babul who took his cows to a hillock for grazing. These cows were very healthy and used to give a good quantity of milk regularly. One day it so happened that a cow named Kapila didn't give milk at all. Astonished by this, the owner questioned Babul about it. So Babul answered saying that Kapila (cow) has been acting strange for a few days and she has been going to a place to pour all the milk. The owner got curious and went with Babul to observe her strange behaviour. There he sees that the cow is pouring milk from her teats at a particular place. So the owner ordered his men to dig the place and found a Shiva Linga to his surprise. 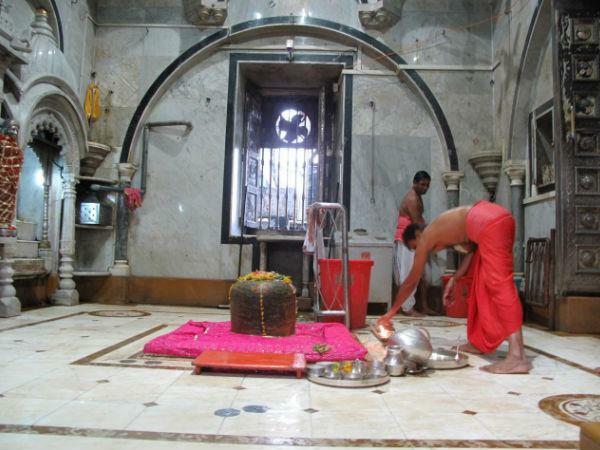 According to this legend, the Shiva Linga was named as Babulnath from this time onwards. Babulnath Temple is said to have existed at the time of King Bhimdev during the 12th century. However, the shrine got buried and lost over time. It was rediscovered in the 18th century and a temple was built by a Gujarati Merchant. Later, the current structure of the temple was built in the year 1890. Interestingly, the temple tower (gopura) of Babulnath Temple is said to have been the tallest structure in Mumbai during this time. Unfortunately, a huge lightening damaged the gopura of this temple. During the excavation, the idols of Ganesha, Hanuman and Parvati were found along with Shiva Linga. Today, the main shrine houses the Shiva Linga and the small shrines are dedicated to other deities. Babulnath Temple is located in Girgaum Chowpatty or Girgaon Chowpatty behind Wilson College in Mumbai. The temple is around 2km from Charni Road. You can either take taxis from Charni Road Station or walk from there. Chowpatty or Choupati is a famous area in Mumbai: Choupati Beach (Ganesh Visarjan), Marine Drive, Nariman Point, Sri Radha Gopinath Temple, Malabar Hill, Hanging Gardens and Mani Bhavan Gandhi Museum are the top tourist places in Chowpatty or Choupati.